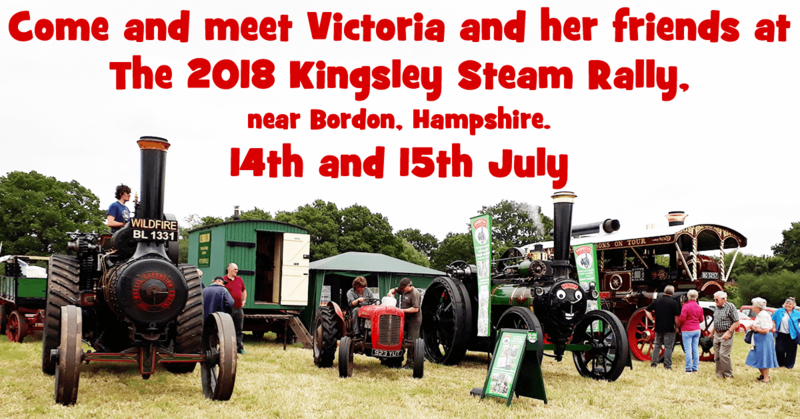 We’re really excited to announce that Victoria and some of her friends will be at the 2018 Kingsley Steam Rally on the 14th and 15th July, helping raise funds for MacMillan Cancer Support. We’re hoping for good weather, and if the ground is good too, Victoria would like to take visitors for trailer rides around the field! Come along and meet Victoria and her friends, Finnigan the Tractor, Lady Pride of England and Wildfire. Enjoy the sights and sounds of steam engines, both large and small, vintage and classic cars, tractors and motorbikes, stalls and stationery engines. There’s going to be plenty to see and do. The show is at Sickles Lane, Kingsley near Bordon, Hampshire. « Schools and Beaver Group get their Free Colouring Pics!